My youngest son is at Boy Scout camp this week. Wednesday is always family night. Parents, siblings, and friends always show up with favorite foods. My kid is a healthy eater. He wanted green beans, tomatoes, melon, mashed potatoes and gravy. Other kids wanted fried chicken from home, homemade rolls, brownies and other "comfort" foods. Needless to say, it was a great meal. After the pot luck, the leaders had a big splash contest. I'm not sure if our troop leader made the biggest splash in the water, but he did make the biggest costume splash. He dressed up as a mermaid as you can see above. Well, perhaps that's a merman costume. 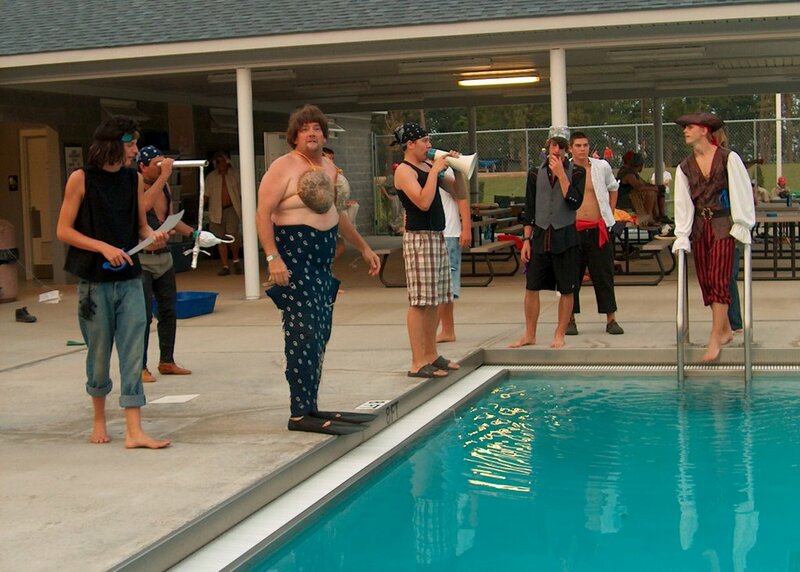 The camp counselors are all dressed in the pirate theme as you can see. It was a fun evening and brought back memories. My brothers went to the same camp years ago, and we always went to family night. Both brothers worked as camp counselors at various times, so that was a lot of Wednesday night visits. If you're headed to a pot luck or just need side dishes for your barbeque, then I have started a list of Grilled and Chilled recipes at Garden and Hearth. Barbecue from "Across the Pond"
Do you make the best grilled hamburgers ever?